Snapchat Geofilters are surprisingly affordable and quick to create. Jerry Potter is the CMO at Mastodon Media and a consultant at Five Minute Social Media. 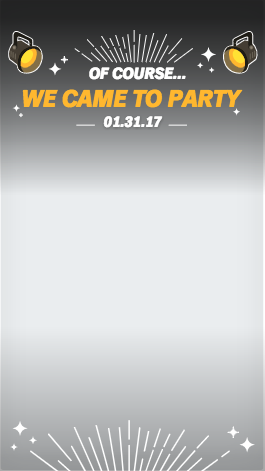 How do you create a Snapchat Geofilter for your event? You might be surprised at how easy it can be. By the end of this article, you’ll not only know how to create your own Geofilter, but also much they cost, and how to make sure Snapchat doesn’t reject it. A Geofilter is a Snapchat filter tied to a specific location. Attendees swipe through and add them to their photos and videos. They are a great addition to any event. 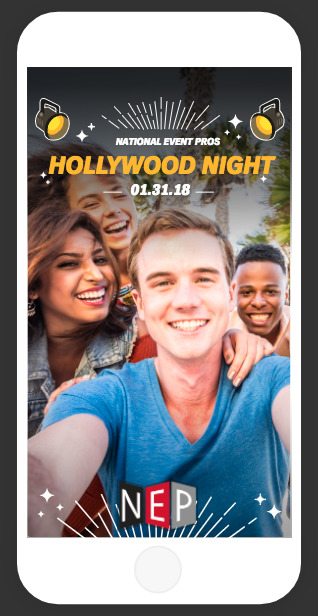 Not only will your Snapchat using guests enjoy them, but everyone who views your guests’ Snaps (their posts on Snapchat) will learn about your event or brand. To get started you’ll want to visit geofilters.snapchat.com. Once you’ve created your design you can upload it to the page. 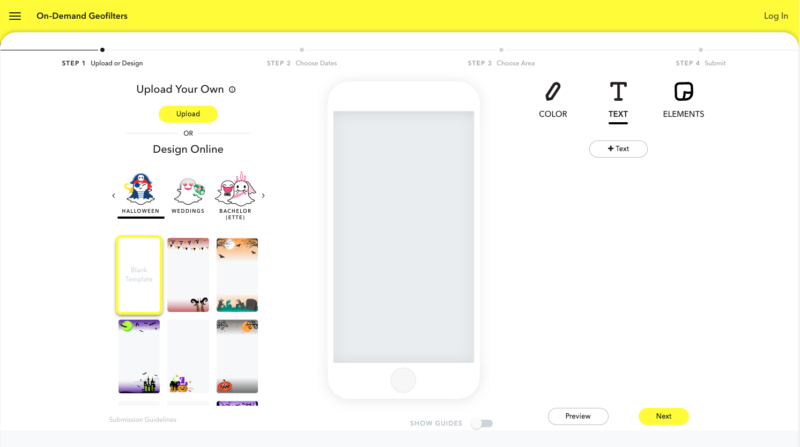 Even the most experienced designers might enjoy the ease of using Snapchat’s design tools! Each theme will take you to a different set of templates. You can also choose a blank template. After choosing a template you can modify it by selecting COLOR, TEXT or ELEMENTS. Clicking through the color choices changes the entire scheme of your Geofilter. Your first consideration should be to choose colors that work well together, followed by colors that fit your event, brand or theme. When you are happy with the colors, click Text to edit what appears on the screen. 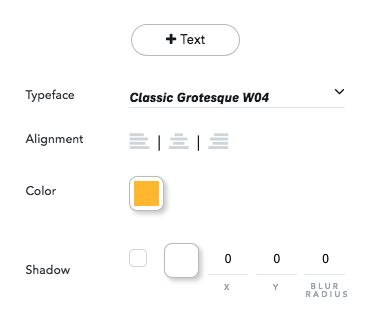 You can click on existing text to move, rotate or delete it, and use the tools on the right to change the typeface, alignment, color and more. Double-click on any text to edit the verbiage. If you want to add more text, click the +Text button. Below you’ll see how I changed the text from the original template. If you want to test how your Geofilter will work with an image, click the arrows on either side of it. If you want to add an image created somewhere else, such as a logo, you can click on ELEMENTS and upload it to your project. Make sure to only use images for which you own the rights. Once your Geofilter looks the way you want it, click Preview on the lower right to see how it will look on a phone. If everything looks the way you want, click Next. On this screen you’ll choose the dates and times you want your Geofilter to be active. After a $5 minimum, the longer it is active the more it will cost. If your event runs multiple days, consider scheduling them separately for each day to avoid paying for hours when no one is there. The minimum time for a Geofilter is one hour, and the maximum is 180 days. If you are interested in having one available longer, you can buy an annual plan. 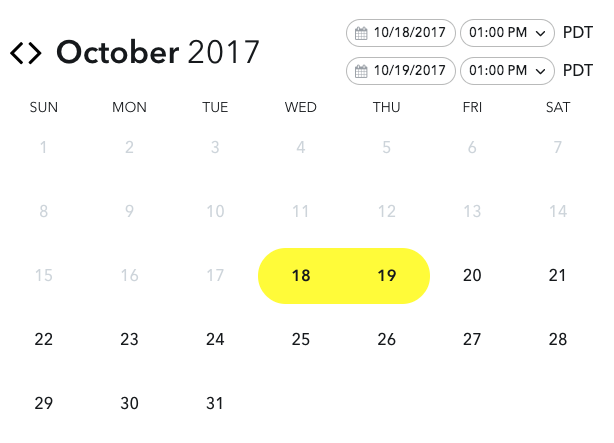 After your dates and times are set, click Next. 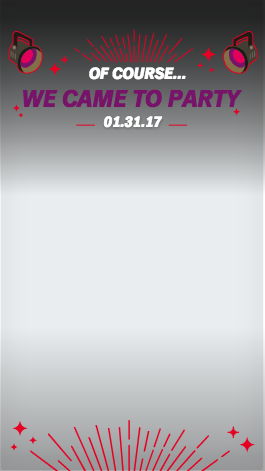 Now you will choose the area the Geofilter will cover. Begin by typing the venue name in the Search bar at the top. Select your venue. If your venue is not listed in Google, type in the address and hit enter. 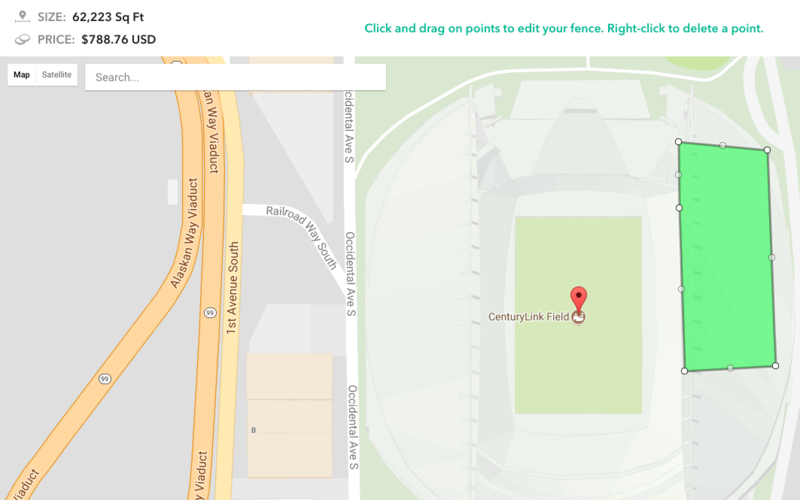 The green area shows the default geofence, a virtual fence around the area your Geofilter will be active. Do you want to cover the entire venue, or is your event in just part of the venue? Should the parking lot be covered so people can use it while taking breaks outside or waiting in line? If your event is a drop-in affair, consider covering areas nearby to draw in newcomers. 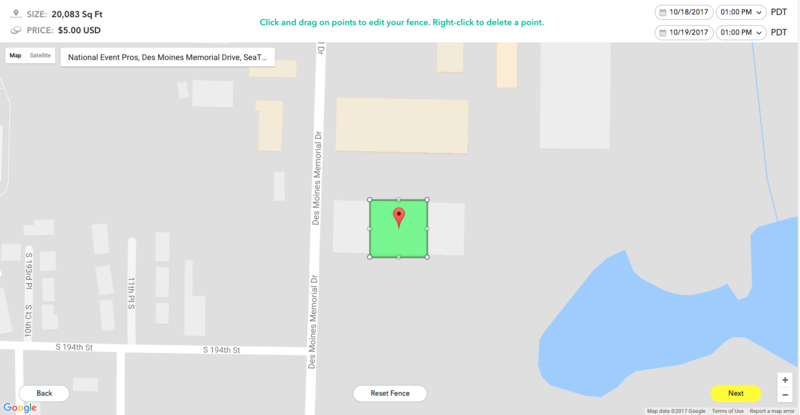 Your geofence needs to be a minimum of 20,000 square feet, and can be up to 50 Million Square feet (which is bigger than Central Park in New York City). 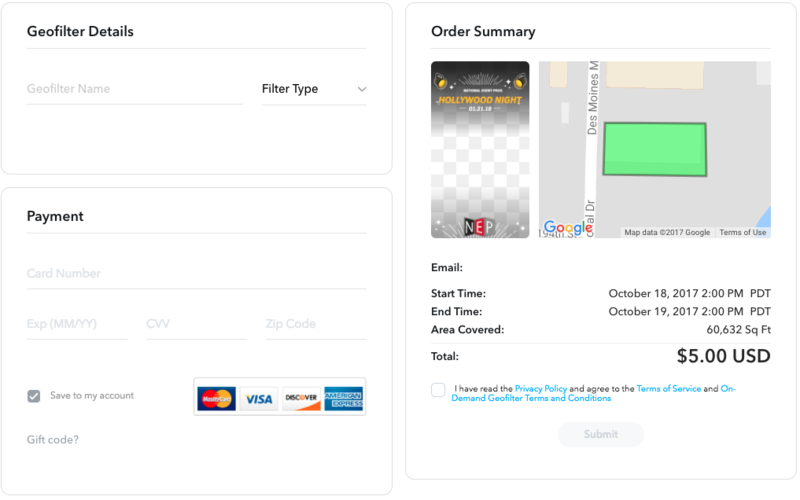 As you adjust the geofence, you’ll see the square footage and the price change in the upper left corner. 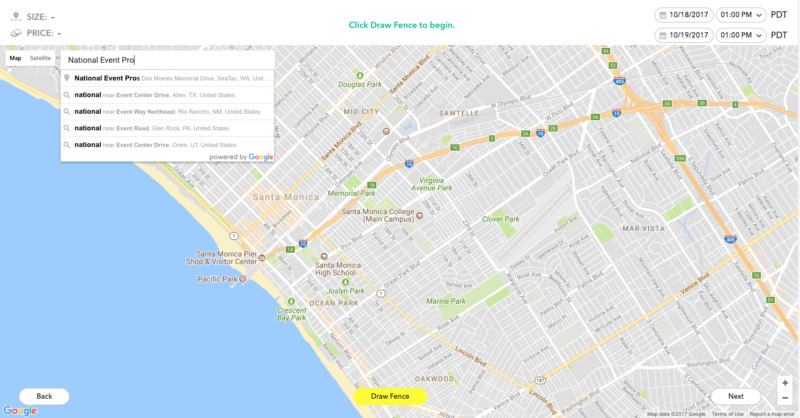 In addition to the size of your geofence and the duration that your Geofilter will be active, the cost will be based on the population density of your location. Covering our headquarters of over 60,000 square feet for a full 24 hours is $5. 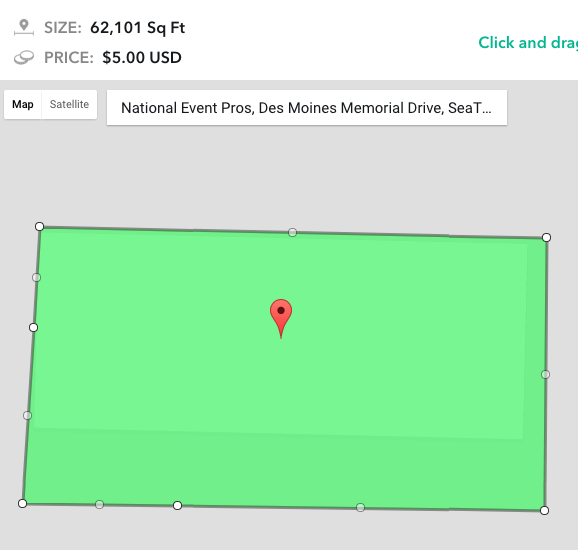 Meanwhile, a few miles up the freeway at CenturyLink field, a similarly sized Geofilter is over $700! In some of my tests, we discovered the dates you choose can affect the cost as well. When you are happy with your geofence, click Next. If you haven’t logged into your Snapchat account yet, you will need to now. Complete the information on this page, including payment info, and your Geofilter will be submitted to Snapchat. They usually approve Geofilters within a day and sometimes within an hour. Because it could be rejected, I’d suggest submitting it as early as possible. Then you’ll have time to fix it and resubmit before your event. You can also create Geofilters on a mobile device in the Snapchat app. Snapchat’s submission guidelines for Geofilter approval are pretty straight forward. 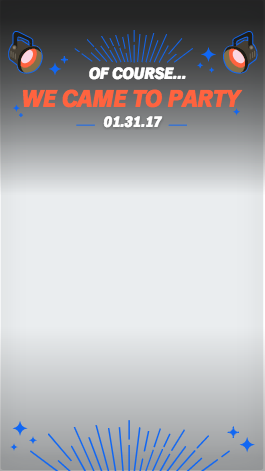 On that last page you’ll choose if the Geofilter is for personal or business use. Personal Geofilters can’t contain any branding, business names or logos. They are commonly used for weddings, birthday parties and other personal events. Business Geofilters must include a business name and you can use logos. There is more fine print and you can read it all here, but those are the basic guidelines. 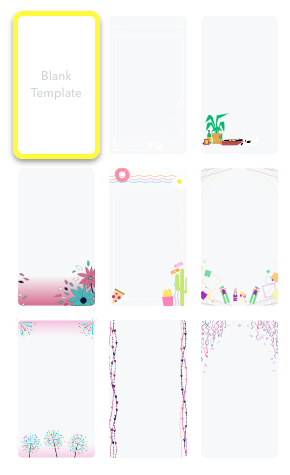 Now that you know how to create a Snapchat Geofilter, how will you use them? Get creative! You might even consider using them at an event that isn’t yours! 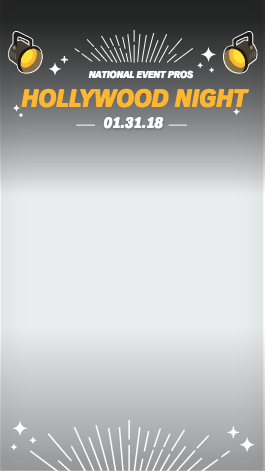 You could create a Geofilter to promote your event and have it up during a similar event that takes place weeks earlier. 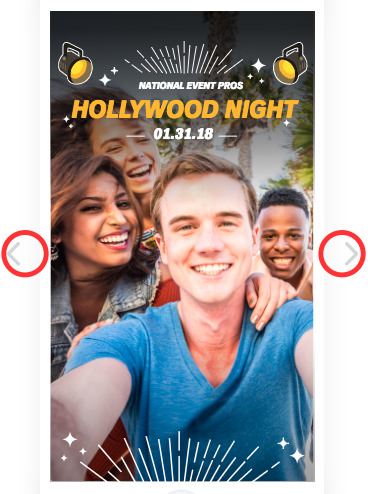 Need help with your Snapchat Geofilter, or any other social marketing for your event? Contact us here.